Thanksgiving is almost upon us. How do you talk about it with your children? Many of us learned a story about Pilgrims and Indians sharing a happy meal of New World foods–turkey and cranberries and pumpkins. If we got into the details, we learned the difference between the Puritans and the Pilgrims and knew that the indigenous people involved were the Wampanoag. We probably didn’t learn that their leader, Massasoit, was the father of Metacom, who would mount a war against the English colonists that included attacks on more than half of their towns. When he was killed by the colonists, his head was stuck on a pike in Plymouth and remained there for 20 years, a warning sign to others indigenous people who would are rise against white colonists. Yeah, that part doesn’t get taught very much. Thanksgiving isn’t really about colonists and native Americans, at least not in that way. In our family, Thanksgiving hasn’t focused on that singular New England feast but a different historical event: the Civil War. That’s nice, isn’t it? Thanksgiving is a harvest holiday, celebrating agricultural abundance, just like harvest holidays around the globe remind people to look to the supernatural forces that control their health and prosperity. In other words, Thanksgiving was a holiday Lincoln invented to celebrate the westward expansion that would create the economic pressure to end slavery and an effort to invoke religion to justify the violence of the war (God’s punishment for our sins) and frame a restoration of the Union as God’s goal. Above, a marker commemorating the largest mass execution in US history–of Sioux who had attacked white Minnesotans after the US government failed to make good on promises to feed them in exchange for land. Lincoln delayed the hanging repeatedly, in part by insisting that all correspondence about the matter occur through the postal system rather than by telegraph. Originally, 303 Sioux were sentenced the death. Lincoln, a shrewd lawyer, saw through the racism involved in their sentencing and reduced the number by more than 85%, though his political advisors argued that he would have an easier time winning re-election if he executed more. The execution is in contrast to his gentle treatment of Confederate soldiers and POWs. 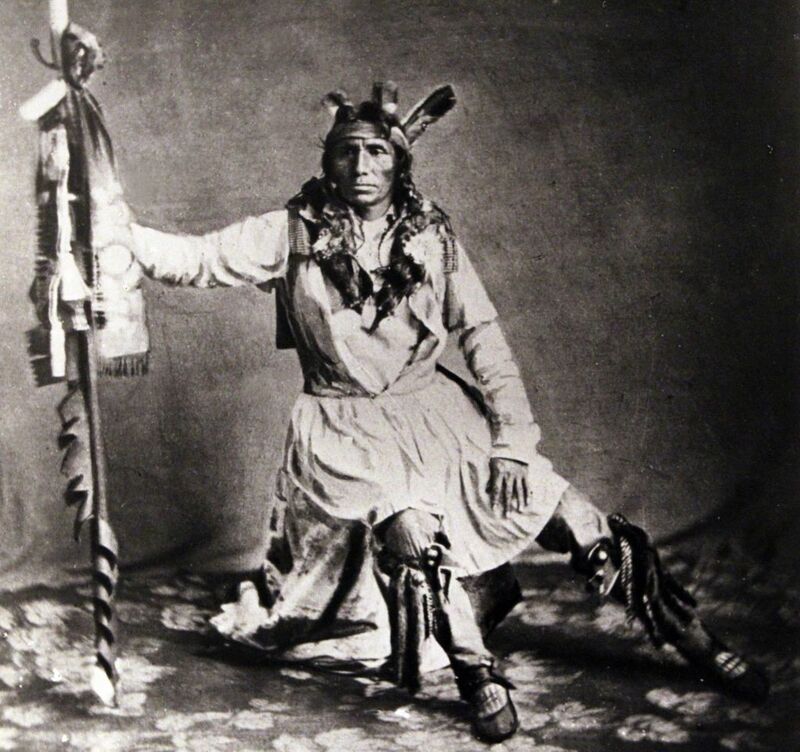 Below, Thaóyate Dúta, commonly known as Little Crow, a leader in the effort to push back white settlements. This makes sense coming from Lincoln, who has been described as holding a “Calvinized Deism” perspective. Despite being a bit of a religious skeptic, Lincoln spoke in ways that galvanized Northern Protestants–key actors in the war effort. His Thanksgiving Proclamation wasn’t a theological statement so much as a political one, as much about slavery as it was about Indian removal. So, do Indians matter in Thanksgiving? Absolutely, and if you haven’t told your children the story of Metacom’s War–the bloodiest war in American history–Thanksgiving is a good opportunity to do it. But the Chippewa, Sioux, Blackfeet, Oto, Pawnee, Omaha, Lakota, Cheyenne, Arapaho, and the descendants of African slaves also matter to our Thanksgiving history. *FDR moved it up, amid much criticism, to the third Thursday of the month. Why? Because we were in a recession, and retailers hoped that expanding the time between Thanksgiving and Christmas would increase the amount of money shoppers spent for the holidays. So, in other words, this has always been kind of a baloney holiday. Previous Previous post: Readings: Do our religious values shape our politics, or the other way around? Next Next post: Where do you give?